In addition to her work as a physiotherapist, Verity Fisher launched, and for the past four years has organised, therapeutic and learning ski experiences to Andorra for National Star students. More than 50 students have been skiing in this time, using the experiences as an integral part of their physiotherapy programme throughout the year. Verity received the United Kingdom Acquired Brain Injury Forum (UKABIF) Stephen McAleese Award for Inspiration. The award was announced by John and Susan McAleese at UKABIF’s 10th Annual and 20th Anniversary Conference in London. ‘I’m really pleased to receive this Award,’ said Verity. 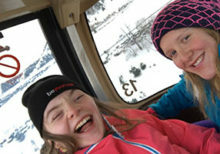 ‘The young people at National Star have a wide range of physical disabilities, Acquired Brain Injury and associated learning difficulties, and my work is all about enabling them to achieve greater independence and where possible progress their rehabilitation utilising a range of physiotherapy techniques and opportunities such as skiing,’ said Verity. The learning experiences to Andorra started as a one-week ski trip for those with moderate physical disabilities who could all transfer with minimal support. Verity has grown the experiences and now runs two weeks, enabling more participation and including students with complex disabilities. This year a range of multi-disciplinary staff, including a tutor supported a trip which further enabled evidence to be gathered for student’s accreditation. Verity has worked closely with the Andorra resort, ski school and airlines, as well as the Andorran ambassador, to ensure that all the young people at National Star have the opportunity to learn to ski. The ski experience has developed to become a key element of National Star’s therapeutic and education programme, with Verity taking a holistic, multidisciplinary team approach. Her work has been recognised by many organisations, including Ofsted and the Care Quality Commission, during inspections at National Star, and was covered by BBC Breakfast TV. View National Star’s wide range of therapeutic programmes, tailored to individual needs and aspirations.